Recrystallization is a purification technique to separate a high value crystalline product from unwanted impurities dissolved in the mother liquor. Strictly speaking, recrystallization is a process in which an initially solidified crystalline material is redissolved and crystallized again to produce final product crystals of desired size, shape, purity, and yield. The underlying mechanisms, dissolution ,and recrystallization can also minimize the crystal's internal energy in order to reach a more global energy equilibrium resulting a stable polymorph. While recrystallization is usually applied deliberately to optimize crystals and processes, uncontrolled recrystallization can lead to the unwanted formation of hydrates and solvates or polymorph transformation. This seven-step recrystallization guide provides essential information to design efficient recrystallization processes with optimal product and process performance. Depending on its molecular structure, a solute can be classified as soluble, partially soluble, or insoluble in these solvents or solvent mixture. To understand this thermodynamic relationship, it is necessary to assess the solute's temperature dependent solubility behavior in a wide range of different solvents. Solubility can be high or low at room temperature, a strongly increasing function of temperature, or almost independent of temperature at all. 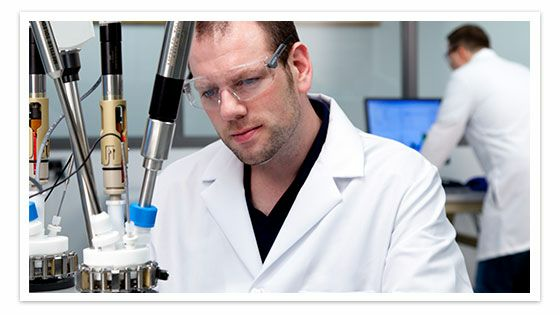 High throughput screening methods quickly determine solubility data for a large number of solute/solvent systems. A solute/solvent system with low solubility at low temperature, but with solubility being a strongly increasing function of temperature, is suitable for cooling recrystallization. A large amount of solute can be dissolved at high temperature and due to lower solubility at low temperature, controlled cooling can initiate recrystallization. Temperature sensitive solutes that decompose at elevated temperatures are not suitable for cooling recrystallization. 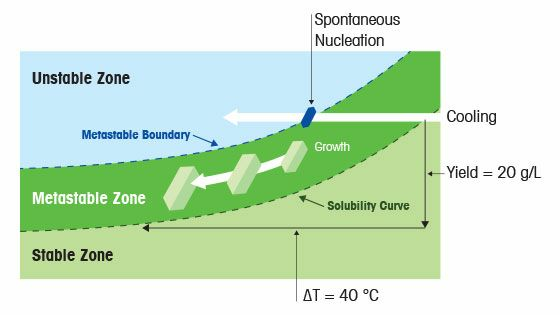 Solute/solvent systems with high solubility at low temperature and the availability of a miscible antisolvent meet the requirements for antisolvent recrystallization. The controlled addition of antisolvent reduces solubility in the mixture and triggers recrystallization. Two common ways of operation are either antisolvent addition to product solution or product solution addition to antisolvent (reverse addition). The disadvantages of antisolvent recrystallization are introduction of an additional solvent, local high supersaturation at the point of addition, reduced volumetric productivity, and the requirement for solvent separation downstream. High solubility at low temperature and the unavailability of an antisolvent often requires evaporative recrystallization. The removal of solvent reduces solubility in the remaining mixture and once sufficient supersaturation is created, recrystallization occurs. Challenges in evaporative recrystallization are the introduction of gas bubbles, which can act as a source of nucleation, difficult to predict seeding points and unpredictable scale-up. When the desired solute is generated through a chemical reaction between two complex compounds or an acid/base neutralization, the method is referred to as reactive recrystallization. The progressing chemical reaction increases supersaturation of the solute, which eventually recrystallizes. Creation of supersaturation can be extremely fast, leading to local high supersaturation at the point of mixing, extensive nucleation, poor process control, and difficult downstream handling. Understanding the solubility behavior of a compound is an important requirement for successful recrystallization process development. Knowledge about how much solute can be dissolved in a solvent and how much solute will remain in the mother liquor at the end is essential to assess recrystallization efficiency. 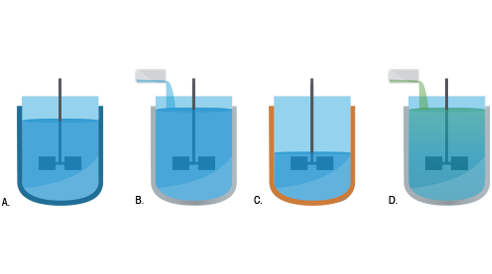 For solution crystallization, the solubility is the maximum amount of solute that can be dissolved in a given amount of solvent at a specific temperature. A system is supersaturated when the concentration of dissolved solute exceeds the solubility limit at a given temperature. 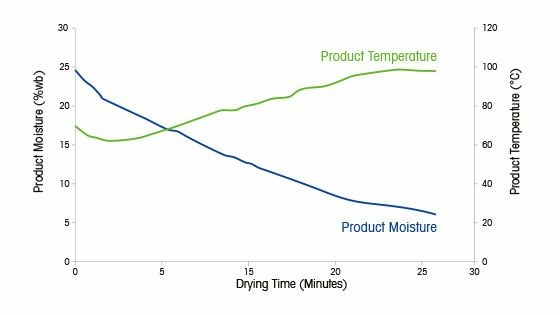 Depending on kinetics, the solution has the ability to remain supersaturated over a range of temperature and time before it recrystallizes. The elapsed time between the creation of supersaturation and the formation of the first crystals is called induction time. Increasing supersaturation reduces induction time to a point where the formation of crystals happens spontaneously as soon as supersaturation is further increased. This point is defined as the Metastable Boundary, the difference between solubility curve and Metastable Curve being the Metastable Zone Width. Tiny (0.1-1 %): Hopefully avoiding oiling out, uncontrolled nucleation, or crashing out. It may be satisfactory in the laboratory, but is rarely effective or robust at larger scale. Small (1-5 %): Controlled nucleation but not enough to exclusively obtain crystal growth. Secondary nucleation along the process and bimodal distributions are likely. Large (5-10 %): Improved probability of crystal growth with the chance to suppress secondary nucleation to avoid bimodal distributions. 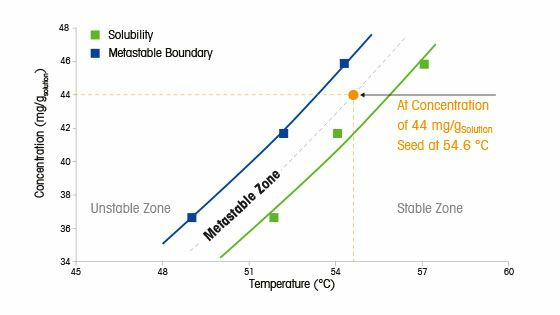 Effective seeding depends on the method and time of seed addition, quality of seed material, and the rate at which supersaturation is generated. Seeding is most effective if crystals are added as a seed slurry halfway into the Metastable Zone. The seed crystals should be uniform in size and provide smooth surfaces to activate recrystallization. Many recrystallization processes benefit from seed aging, where the temperature is held constant after seeding until supersaturation is depleted before continuing. 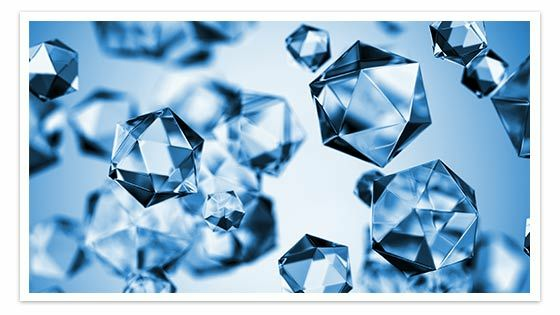 Minimizing process time, energy consumption, and waste, optimal resource allocation and high process yield are important parameters to produce sellable crystal product at the lowest cost. Based on the solubility data one or more recrystallization methods (e.g. cooling, antisolvent, evaporative, reactive) are applied to reach an endpoint of high yield in the phase diagram. Careful control over the degree of supersaturation and an understanding what particle mechanisms crystals go through is essential to design efficient recrystallization processes with optimal downstream performance. After filtration, the cake is commonly washed with an easy to evaporate antisolvent to remove remaining mother liquor and to help with the drying process. 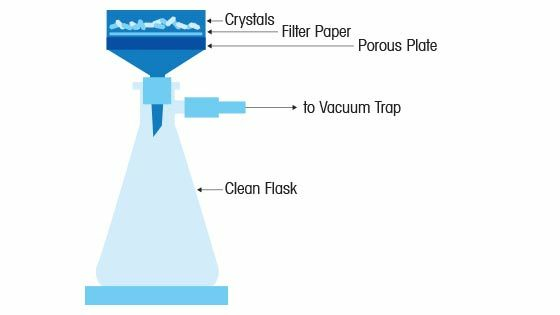 The evaporative removal of moisture from the wet filter cake is often the final production step before a usable crystal product is obtained. Depending on the thermal and mechanical stability of the Active Pharmaceutical Ingredient (API) molecule and crystal, the solvent type and the risk of polymorphic transformation, a suitable drying method (atmospheric or vacuum) is applied. 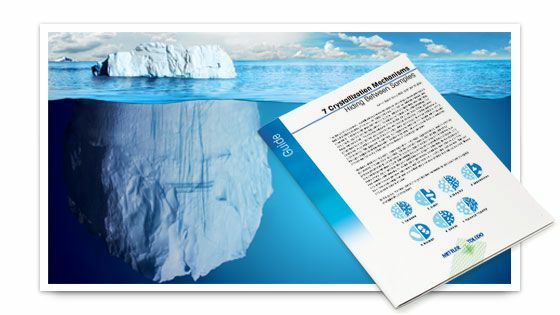 Below is a selection of recrystallization articles in publications. A Recrystallization Workstation with in situ PAT minimizes the need for sampling and provides real time process data for immediate interpretation, substantially reducing development time and cost for offline analytical work. Continuous data collection provides a more representative picture of the process, which enables full process understanding. Integrated software solutions allow full recrystallization automation (Feedback Control Loops) and safe overnight operation. Do Hidden Mechanisms Put Your Recrystallization at Risk? Viewed from the outside a crystallization process may appear to be running smoothly. But hidden crystallization mechanisms are usually occurring that can dramatically impact the final outcome. This practical guide describes seven hidden mechanisms that can influence your crystallization process and outlines strategies to control them.